This table was brought to us by our BFF Loren, isn’t she amazing? Yes! I adore the sawhorse/ trellis style blend this table has, and I adore the portability of it! Pull it out when you need it, fold it away when not in use…genius! And a pretty simple build as well! 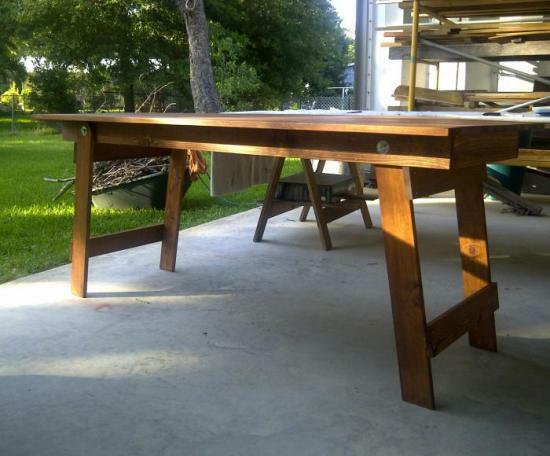 I also think this would make an incredible craft table or portable conference table, even a great place to dine outdoors! So many things I can imagine using this beauty for! 1 – 1×4 at 10’ OR 2 at 6’ OR 2 more at 8’ if they are cheaper or easier to transport. 1 Sheet 3/4” Ply – can also use edge glued laminate project boards or boards glue and screwed together using your kreg jig, at a size of your choice, just be sure to adjust the apron dimensions and if need be the stretchers as well. Build the Top: If you are using a Kreg Jig create your pocket holes in the yellow aprons to connect them to the blue aprons, as well as around the inside of both yellow and blue aprons, spaced 6-8” apart. Construct your Table Top Frame by attaching the aprons using your 1 1/4″ pocket hole screws and glue. Then attach the Table Top frame to the Top itself using your 1 1/4” pocket hole screws and glue. If you aren’t using a pocket hole system, use 2” screws and glue to construct the frame, be sure to countersink, and then attach the frame to the Table Top using 2” Finish Nails and glue. Construct the Leg Units: The Legs themselves will require a 10 Degree Cut at the bottom and a rounded edge at the top. The rounded edge at the top should have a 1 1/2” radius and can be created using a sander or a jig saw. Once your legs are mitered and rounded, you can attach the lower leg stretcher (blue) using 2” screws and glue, be sure to countersink. Before you attach your top leg stretcher (yellow) you should create a 10 Degree Bevel along the top edge. This will act as a stop when the legs are un folded and the table is in the upright position. You can create a 10 Degree Bevel using a table saw, circular saw, even a jig saw or hand saw if need be (I suppose if you were diligent, you might also get the job done with your sander if none of the tools mentioned are available to you) and you are simply trying to give that top edge of the top stretchers a flush method of stopping so that the legs are slightly splayed as you see in Loren’s finished pictures. Once you have created your bevel attach the stretcher to the legs using 2” screws and glue and place them 14 1/2” from the lower stretchers. Attach the Leg Units: To attach the Leg units, you will simply need to drill a hole through both the legs and the aprons in the location where the legs will attach. The bottom outside edge of your legs should roughly align to the aprons above when they are sitting at the appropriate angle. To attach the legs, Loren simply used a bolt, washer and lock nut! Easy peasy, lemon squeezy! You can see how this will look in the image below and frankly I think it adds to the appeal of the table…adore! You will need to drill a hole that is roughly the size of the bolt shaft diameter or a tad larger. The legs will be offset and opposite on each side as you can see below..in other words one leg unit on the outside of the apron on the left and the opposite leg on the outside of the apron on the right side. This allows for the legs to collapse easily when you fold them in. This is an excellent design! I am working on my second one (one for me and one for my daughter). I did have a hard time deciding exactly where to drill the holes. Any guidance?